Take the simplest route to easygoing smart style and wonderful comfort with the SKECHERS Relaxed Fit®: Commute Time - Knitastic shoe. 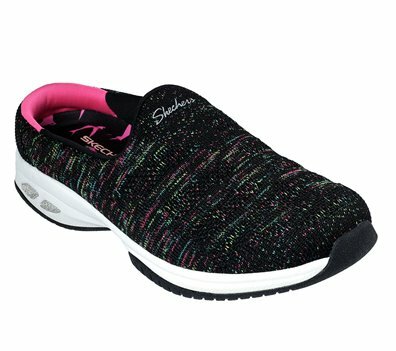 Skech Knit Mesh nearly one piece fabric upper in a slip on low backed sporty casual comfort sneaker clog with stitching and overlay accents. Air Cooled Memory Foam insole.